I started in the early 80ies to make my own sound as H 6 4. At first I was influenced by the aesthetics of Futurism and Dada - an antistatement of society and music. Franz de Waard of Vital called my music as some of the hardest music in Europe. I was active in Cassettemusicscene with two Labels (DDT-Tapes and EX) and in the Mailart Network. I make a fanzine called "Magazine". Some years later I discover the possibilities of natural sound phenomena - the structure and signals of being there. In 1991 I formed the "Hör-Bar" with Y-Ton-G and Malte Steiner, a music club for the advancement of experimental music with monthly concerts and change mine musical name in tbc. The main idea was to make a room for exchange of musical ideas and the possibility to meet musicians from around the world. Then I started my own record label with smartman Stickel: "Wachsender Prozess" for noise culture based sounds. Now he disfuctioned and make his own business. 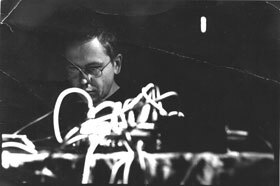 Together with Günter Reznicek (Nova Huta) und Felix Knoth (Felix Kubin, Klangkrieg) publication of a magazine (Odradek) about electroacoustic and electronic music, which life without them today. Also the production of a two weekly radio program (Radio Gagarin) dealing with experimental music by FSK, a local autonomy radio station: live session, interview and affinity. Realization of own short films, art stuff and active as DJ (Nachtschwestern/FSK and Crossfadeentertainment parties, to name a few) and sound mixer. I done several Performances with the improvisional electronic group Six and More. A New Project with Jan Iwers aka No called Freie Hand was born in 1999 for exploration of rhythmical biostructures in electronic sound manipulation. It was a electronic improvisational live group with several live performances. Its now dysfunctional after successful live performances. A new performance noise group with bass player and record label owner Guy Saldanha is active now. Another successful collaboration was with Heiner Metzger from the H7 organization of improvised music. They are some mail music projects: Brume, Artificial Memory Trace, Das Synthesche Mischgewebe. Also some interactive sound installation with Istari Lasterfaher and label art exhibition at different spaces. Today he played in the improvisation noise group 180 Grad and drink some beer, if he bored. tbc is a citizen of Elgaland/Vargaland.